First of all, congrats on this incredible milestone! For those still not knowing Sylius, could you please introduce the project? Thank you! We are extremely proud of this release and our community. Sylius is an eCommerce Framework, which means we are trying to solve 70-80% of the most common eCommerce problems with a cutting-edge development platform. Very often it is more than enough for small shops, so people build them with Sylius as well but generally we are targeting more customized medium to big eCommerce applications. In your website, you claim that "We believe Sylius will make eCommerce developers enjoy their work again". Why is that? I started Sylius project as a single developer and focused on making it nice to work with for me. We stick to that philosophy to this day, so the framework comes with the latest & greatest Open Source tools. We avoid reinventing the wheel, we obviously rely completely on Symfony, Doctrine, Twig and other very popular, well-known & battle tested solutions. This makes it much easier to learn Sylius, especially if you have worked with the tools listed above before. What is more, we are very serious about testing, Clean Code & Test-Driven- Development. I think it is safe to say, that Sylius is one of the most tested Open Source projects out there. We adopted BDD workflows with Behat & phpspec from the very beginning and cut our teeth on them. This makes the communication between developers and stakeholders much more efficient and testing is pure fun. The e-commerce sector is crowded with lots of solutions. Which are the main features that make Sylius stand out from the competition? We identify a couple of things that make us different from other solutions. First of all, it is High Developers Productivity. We have seen 480 person-hours of work on top of the most popular platforms like Magento transformed into 160 person-hours with Sylius. Known Open Source tools, testing, SOLID principles and attention to the DX (Developer Experience) creates a lot of love for Sylius among developers, tired of working with solutions created 10-15 years ago. Secondly, as I mentioned already, we try to stay focused on the core problems of eCommerce. I believe that the next big thing in eCommerce software world is not the platform, which gives you more features than Magento but the one that integrates with the best solutions in their category. For example, instead of stuffing Sylius with huge features used by only a part of our community, we want to integrate with Customer Loyalty software (like OpenLoyalty.io) and avoid turning Sylius into a unmaintainable beast. That's why we make it easy to create webhooks, use message queues and we provide powerful APIs out-of-the-box. When we are at the API thing, this is something we are really serious about. Backend & frontend separation or (hype alert) Progressive Web Applications are the future of development in our opinion. Currently Sylius ships API suitable for such development as a plugin but we plan to make it part of the core in version 1.2 and it will be a foundation of our strategy. But don’t worry if you still want to have your Twig templates, we will keep that feature as well. Which are the most relevant e-commerce projects developed with Sylius so far? There are a couple of big companies using our project in production with success. REISS, a fashion brand from London, POPSugar Inc. - media corporation in the US which used Sylius to build their subscription box service with thousands of subscribers. We also have the Italian branch of Conforama - the 2nd biggest home furnishing & accessories retail chain in Europe recently launched on top of Sylius by web.burza.hr. There is BestValue.eu, duty free online shopping from Romania. Hbx.com, which is a highly customized fashion store from Hong Kong from one of the most famous trend magazines in Asia. We are currently working on the Customer Success Stories section of our website and also signing the first partnership deals in our Sylius Solution Partner Program. We are overwhelmed with the interest and we can already confirm we will have a lot of very good companies as partners, who will integrate Sylius & provide more stories like these. Wearables, bots, artificial intelligence, voice-based interfaces, augmented reality and many other technologies may disrupt the traditional web-based e-commerce platforms. Do you feel we're at the beginning of the e-commerce revolution or will it take some time to see those technologies widely adopted? With such a fast-moving technology development we can speak about a constant, on-going revolution but I do believe some of these inventions will disrupt the market and all brands & retailers (and their eCommerce platforms) should be ready for that. I have a feeling that some of these technologies may not necessarily become mainstream tools in eCommerce but some for sure and that's why we put such strong focus on APIs. We want the engine to be decoupled from UI. Desktop or mobile is just one way of customer interaction and the software should be prepared to talk with any existing or new device that will change the way we shop forever. Which are the main benefits of using Symfony Components to develop a project like Sylius? You know, I have a quite easy way with words but now it is difficult for me to describe how thankful we are to the Symfony project and its (our) community. Sylius started from an 18 years old me, who discovered the banner on the old symfony-project.org website promoting Symfony 2.0 Preview Release. And Symfony community was nothing else than enlightening and welcoming to me. It not only gave us an excellent technical foundation but also created a platform to participate in community conferences, attract developers, build a business and I think it is safe to say that Sylius grew a lot on the hype of Symfony and connected projects (Doctrine, Behat, phpspec). Of course, we like to think we contributed back with evangelization and proving that all these tools are awesome indeed! Sylius 1.0 is based on Symfony 3.x, but Symfony 4 releases in November 2017 and, together with Symfony Flex, they will revolutionize the development of Symfony applications. How is Sylius preparing for Symfony 4 and Symfony Flex? We are excited with the upcoming release and especially with Symfony Flex as it can greatly improve our plugin system. That being said, we are still exploring how to apply these new ideas to Sylius and maintain Backwards Compatibility. We are 100% sure we will support the latest Symfony. We have upgraded since alpha versions, so I am sure we will manage to do this smoothly again with version 4. The core team of Sylius is located in Łódź (Poland). How is the Symfony community in Poland? Poland has a lot of great developers, so Symfony community in Poland is really big. I think it is one of the most popular frameworks for web development and pretty much there are Symfony-related talks on every single meetup or conference. The first SymfonyCon in 2013 was in Warsaw (Poland) and it gathered a lot of polish developers. I believe that now it is even more impressive number. That might also give you a hint where do we plan to organize the first ever SyliusCon. Congratulations again to the entire Sylius community and thanks to Paweł for his time. If you want to support the project, consider giving Sylius a star on GitHub, follow Sylius on Twitter, join Sylius Slack chat and read Sylius blog. 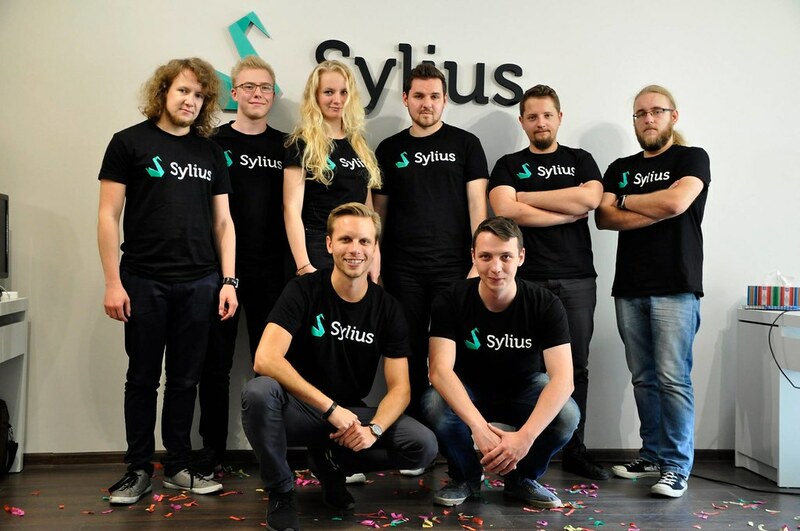 The entire Sylius Team during the Sylius 1.0 version release party. Tried Sylius few times and there was always some bug. Will try it again in few years. Sorry, didn't know that all that time it was just a beta. Thanks to Paweł and the Sylius team for sharing their hard work as OSS! This is a great thing, finally a good solution for e-commerce and built on top of Symfony, can't ask for anything better than this. 3600 stars, 1200 forks, I'd say it's a very active project and lots of developers like it! Sylius is not only good for e-commerce, but also has a number of stand-alone bundles/components like the Mailer (using this for Park-Manager) and theme (which is properly the best I have seen so far, haven't used myself though but definitively planning to use it! ).